Some members of the governing coalition had earlier hinted that less drastic steps, such as a fine, may be considered, but the leaders of both ruling parties vowed a hard line and Prime Minister Giuseppe Conte later said he had put words into action. “Today the government…has formally sent to Autostrade per l’Italia the letter of complaint which launches the process for revoking the concession,” Conte said in a statement. The statement said the disaster was the fault of the company which “had the obligation to look after the ordinary and extraordinary maintenance of the motorway”. It added that Autostrade now had 15 days to present its counter-arguments. Matteo Salvini, deputy prime minister and head of the right-wing League party that governs with the 5-Star Movement, said the procedure for revoking the licence would take “weeks or months”. Some sector experts estimate that if it revokes the concession the government will have to pay Autostrade up to 20 billion euros ($22.85 billion) in compensation for investments the firm has made, though the government denies this. 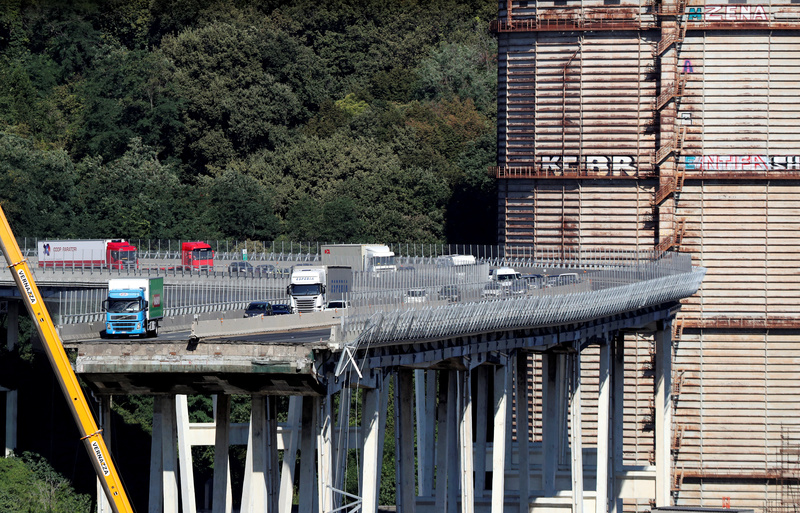 Shares in Atlantia, parent company of Autostrade, plunged more than 30 percent after the bridge collapse in Genoa on Tuesday, but recovered somewhat on Friday, closing up 5.7 percent. Atlantia is controlled by the holding company for the Benetton family, famous for its clothing empire. 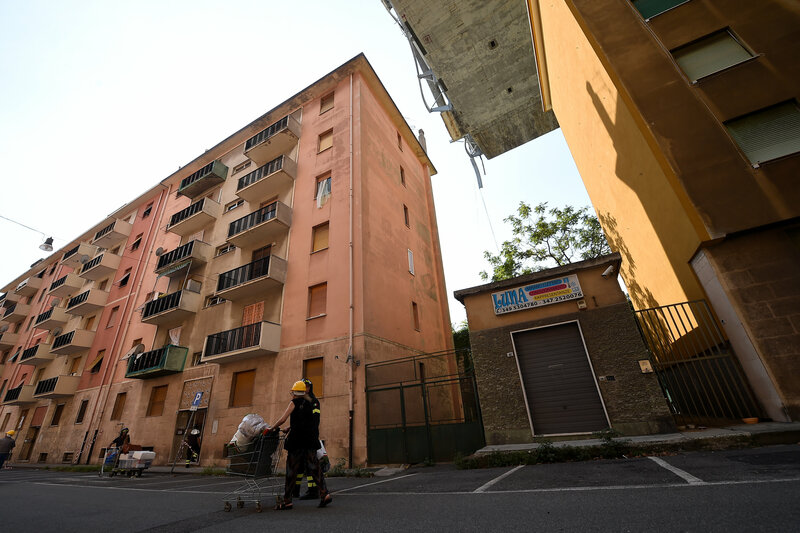 Conte said that from now on the government would compel holders of concessions in all Italy’s creaking infrastructures to invest more of their profits in maintenance and safety. “This disaster obliges us to take new initiatives which are far more rigorous than those contemplated by previous administrations,” he said. 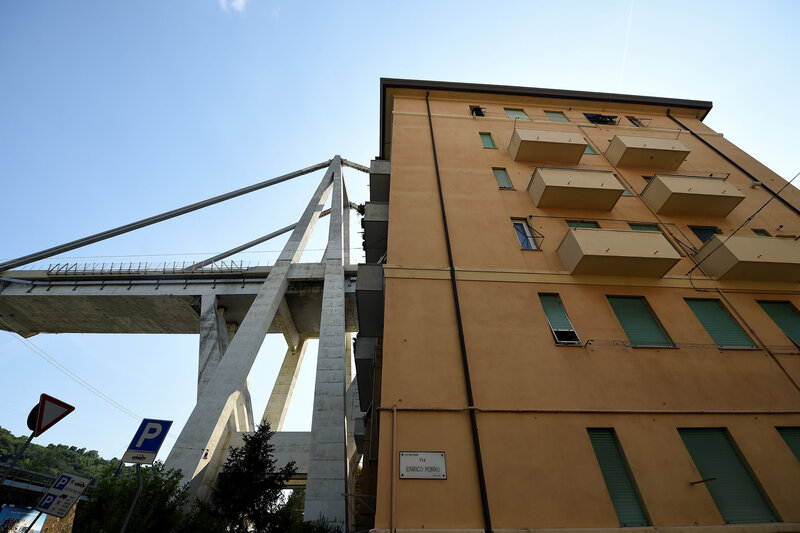 A Genoa court will try to establish the exact cause of the bridge failure, but experts said problems with the concrete-encased cable stays were a possible culprit. An engineering study commissioned by Autostrade last year warned about the condition of the stays, said Carmelo Gentile, a professor from Milan’s Polytechnic university who was on the team that carried it out. 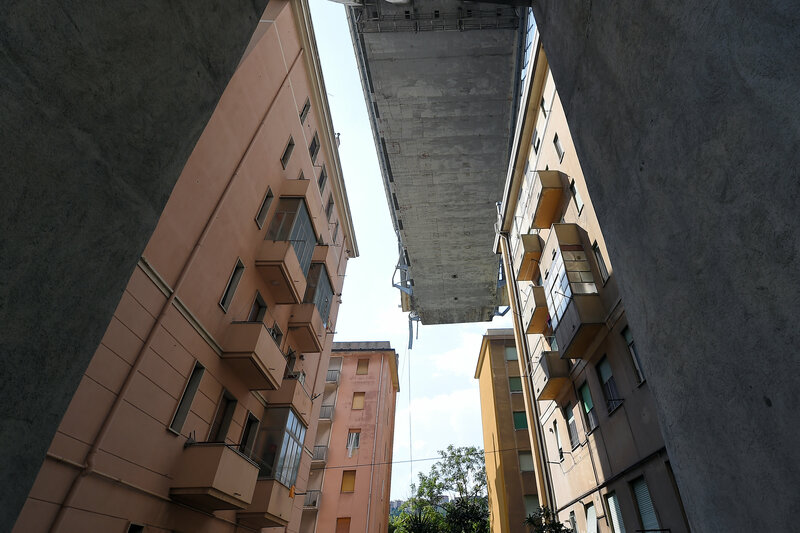 Antonio Brencich, an engineering professor at Genoa University, said the bridge had been shown to be defective just two decades after it was opened in 1967. On Friday, he said the failure of a cable stay could have been behind the collapse. 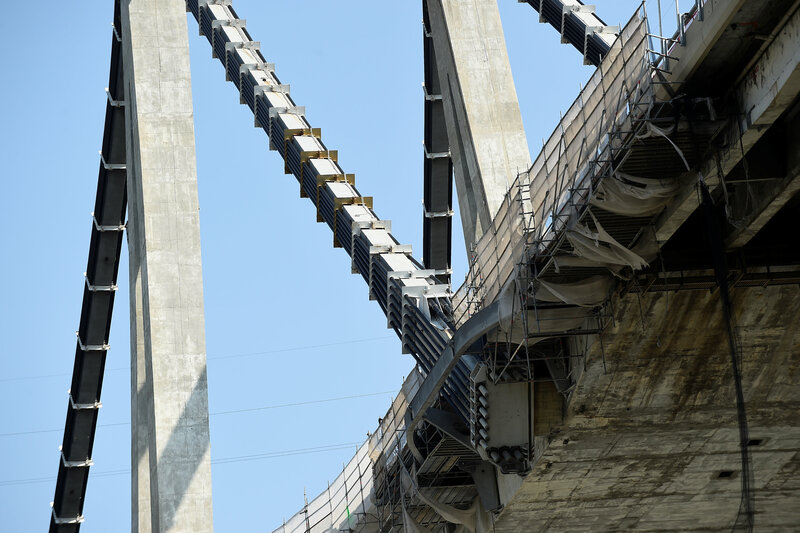 Autostrade has said it monitored the bridge on a quarterly basis, as required by law, and carried out additional checks by hiring external experts. It had no immediate comment on Friday’s reports about problems with the stays. As politicians responded to public outrage over the tragedy, rescue workers used jackhammers and cranes to lift giant slabs of concrete from the riverbed beneath the fallen span, hoping to find survivors buried in the rubble. More than 300 firefighters have been working non-stop since Tuesday, though experts say chances of finding survivors are now slim. The civil protection agency said on Friday that five people feared to be near the site of the disaster were still unaccounted for. 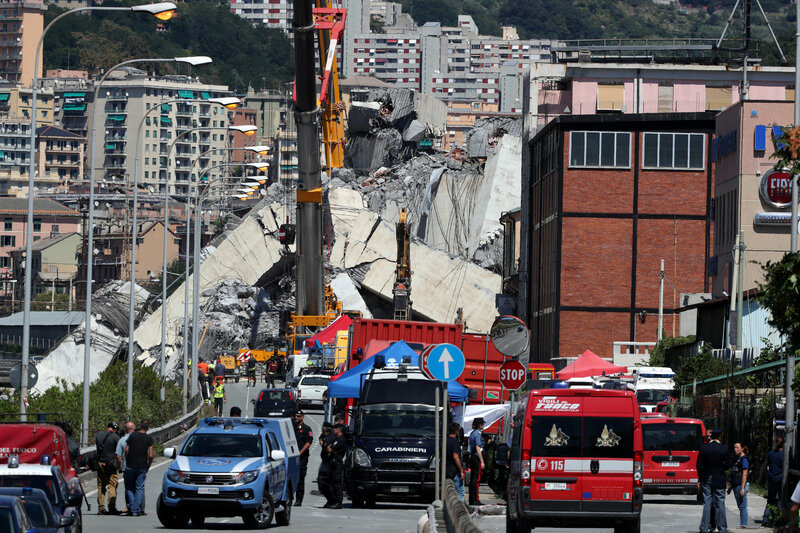 Vehicles on the highway that links Genoa to the French border west of the Mediterranean port city plummeted 50 metres (165 feet) when a 200-metre (660-foot) stretch of the viaduct collapsed. Firefighters, who are using sniffer dogs as well as heavy machinery, have not yet reached all the cars. “We are trying to find points where we can penetrate these incredibly heavy slabs. Then the earthmoving equipment moves in to create a passageway where the dogs can enter,” firefighter Stefano Zanut said at the scene. Rescuers are hoping the large chunks of debris may have created a “triangle of survival” when they fell, where someone could still be alive, he said. 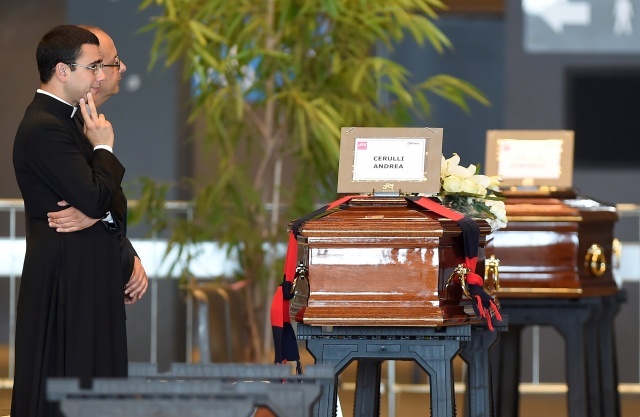 A state funeral for many of the victims will be held on Saturday at Genoa’s convention centre, led by the city’s archbishop, Cardinal Angelo Bagnasco, and attended by President Sergio Mattarella and Conte. 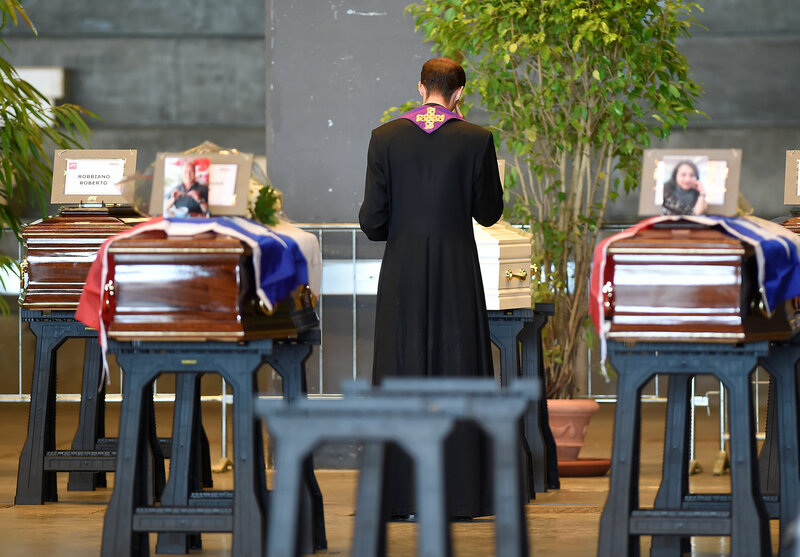 Twelve coffins have already been placed in a large hall, and family members visited them on Friday, sometimes kissing the caskets. One white coffin held the body of seven-year-old Samuele Robbiano, who died alongside his parents. 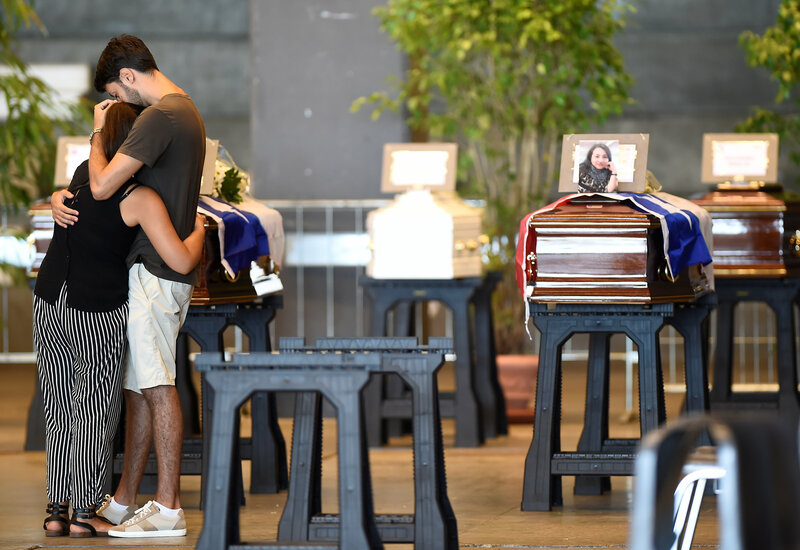 “It is something that has touched everyone because we all used the bridge and it could have happened to anyone,” Bishop Nicolo Anselmi said after blessing the coffins. Some families plan to boycott the event and hold their own private services, as a sign of protest against what they say was negligence that caused the bridge to collapse. 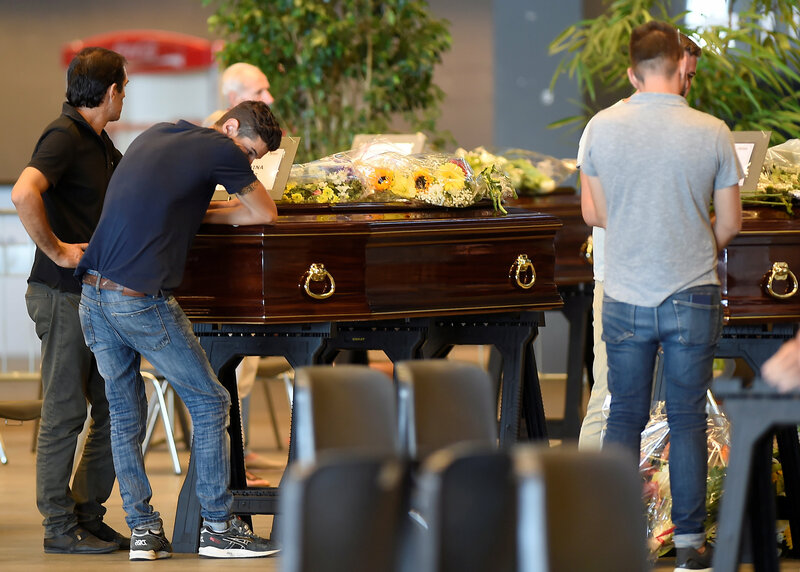 The funeral of four young men who were en route to a holiday together in France and Spain when the disaster struck was being held in Torre del Greco, near Naples, on Friday.